Small portions of male DNA, most likely left over in a mother's body by a male foetus can be detected in the maternal brain relatively frequently, according to a report published Sep. 26 in the open access journal PLOS ONE by William Chan of Fred Hutchinson Cancer Research Center and his colleagues. This shows a male cell in female human brain. Montine TJ, Sonnen JA, Guthrie KA, et al. The process, called foetal 'microchimerism (Mc)’, is common in other tissues such as blood, but this is the first evidence of male Mc in the human female brain. Microchimerism can be both beneficial and harmful to maternal health, since it is associated with processes such as tissue repair, as well as to autoimmune diseases. 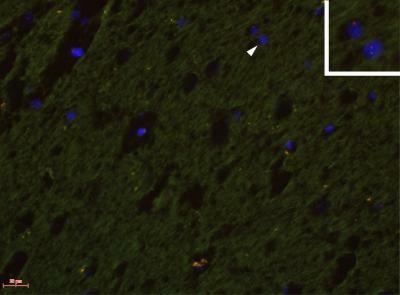 Testing for the presence of a particular region of the Y-chromosome in autopsied brain tissues, the research team discovered that 63% of their samples showed potentially long-lasting Mc in multiple brain regions. They also found that women with Alzheimer's disease (AD) had less Mc than women without the disease. According to the authors, this result warrants further investigation because previous reports have suggested that AD may be more prevalent in women with a higher number of pregnancies compared to childless women. The researchers commented that changes to the blood-brain barrier that occur during pregnancy could facilitate the process by which Mc is acquired into the human brain. "This is the first evidence that microchimerism can cross the blood-brain barrier to establish male foetal tissue in the human female brain" says Chan. 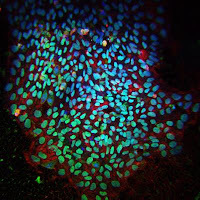 The process researchers use to generate induced pluripotent stem cells (iPSCs) — a special type of stem cell that can be made in the lab from any type of adult cell — is time consuming and inefficient. To speed things up, researchers at Sanford-Burnham Medical Research Institute (Sanford-Burnham) turned to kinase inhibitors. These chemical compounds block the activity of kinases, enzymes responsible for many aspects of cellular communication, survival, and growth. As they outline in a paper published September 25 in Nature Communications, the team found several kinase inhibitors that, when added to starter cells, help generate many more iPSCs than the standard method. This new capability will likely speed up research in many fields, better enabling scientists around the world to study human disease and develop new treatments. "Generating iPSCs depends on the regulation of communication networks within cells," explained Tariq Rana, Ph.D., program director in Sanford-Burnham's Sanford Children's Health Research Center and senior author of the study. "So, when you start manipulating which genes are turned on or off in cells to create pluripotent stem cells, you are probably activating a large number of kinases. Since many of these active kinases are likely inhibiting the conversion to iPSCs, it made sense to us that adding inhibitors might lower the barrier." "The identification of small molecules that improve the efficiency of generating iPSCs is an important step forward in being able to use these cells therapeutically. Tariq Rana's exciting new work has uncovered a class of protein kinase inhibitors that override the normal barriers to efficient iPSC formation, and these inhibitors should prove useful in generating iPSCs from new sources for experimental and ultimately therapeutic purposes." Hunter, a kinase expert, was not involved in this study. At the moment, the only treatment option available to many heart failure patients is a heart transplant. Looking for a better alternative, many researchers are coaxing stem cells into new heart muscle. In Alzheimer's disease, researchers are also interested in stem cells, using them to reproduce a person's own malfunctioning brain cells in a dish, where they can be used to test therapeutic drugs. But where do these stem cells come from? Since the advent of iPSC technology, the answer in many cases is the lab. Like their embryonic cousins, iPSCs can be used to generate just about any cell type — heart, brain, or muscle, to name a few — that can be used to test new therapies or potentially to replace diseased or damaged tissue. It sounds simple enough: you start with any type of differentiated cell, such as skin cells, add four molecules that reprogram the cells' genomes, and then try to catch those that successfully revert to unspecialized iPSCs. But the process takes a long time and isn't very efficient — you can start with thousands of skin cells and end up with just a few iPSCs. Zhonghan Li, a graduate student in Rana's laboratory, took on the task of finding kinase inhibitors that might speed up the iPSC-generating process. Scientists in the Conrad Prebys Center for Chemical Genomics, Sanford-Burnham's drug discovery facility, provided Li with a collection of more than 240 chemical compounds that inhibit kinases. Li painstakingly added them one-by-one to his cells and waited to see what happened. Several kinase inhibitors produced many more iPSCs than the untreated cells — in some cases too many iPSCs for the tiny dish housing them. The most potent inhibitors targeted three kinases in particular: AurkA, P38, and IP3K. 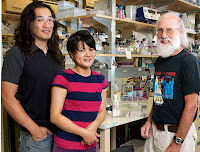 Working with the staff in Sanford-Burnham's genomics, bioinformatics, animal modeling, and histology core facilities — valuable resources and expertise available to all Sanford-Burnham scientists and the scientific community at large — Rana and Li further confirmed the specificity of their findings and even nailed down the mechanism behind one inhibitor's beneficial actions. "We found that manipulating the activity of these kinases can substantially increase cellular reprogramming efficiency," Rana said. "But what's more, we've also provided new insights into the molecular mechanism of reprogramming and revealed new functions for these kinases. We hope these findings will encourage further efforts to screen for small molecules that might prove useful in iPSC-based therapies." What Can the Axolotl Teach Us About Tissue Regeneration In Humans? Based on two new studies by researchers at the Salk Institute for Biological Studies, regeneration of a new limb or organ in a human will be much more difficult than the mad scientist and super villain, Dr. Curt Connors, made it seem in the Amazing Spider-man comics and films. tissue destined to become a new limb, and disrupt the process of regeneration. Credit: the Salk Institute for Biological Studies. But by studying a real lizard-like amphibian, which can regenerate missing limbs, the Salk researchers discovered that it isn't enough to activate genes that kick starts the regenerative process. In fact, one of the first steps is to halt the activity of so-called jumping genes. Salk Institute for Biological Studies. "As complex as it already seems, it might seem a hopeless task to try to regenerate a limb or body part in humans, especially since we don't know if humans even have all the genes necessary for regeneration," says Hunter. "For this reason, it is important to understand how regeneration works at a molecular level in a vertebrate that can regenerate as a first step. What we learn may eventually lead to new methods for treating human conditions, such as wound healing and regeneration of simple tissues." There the scientists found transcriptional activation of some genes, usually found only in germ line cells, which indicated cellular reprogramming of differentiated cells into a germ line state. Active LINE-1 retrotransposons can keep jumping, and that was true in the developing blastema where LINE-1 jumping was dramatically switched on. But in the researchers' companion study, in Developmental Biology, they found that PL1 and PL2 switch off transcription of repeat elements, such as LINE-1. "The idea is that in the development of germ cells, you definitely don't want these things hopping around," says Hunter. "The mobilization of these jumping genes can introduce harmful genomic rearrangements or even abort the regeneration process." In fact, when the researchers inhibited PL1 and PL2 activity in the axolotl limb blastema, regeneration was significantly slowed down. "The need to switch on one set of genes to stop other genes from jumping just illustrates how amazingly difficult it would be to regenerate something as complex as a limb in humans," Hunter says. "But that doesn't mean we won't learn valuable lessons about how to treat degenerative diseases." Salk scientists have identified a unique molecular signature in induced pluripotent stem cells (iPSCs), "reprogrammed" cells that show great promise in regenerative medicine thanks to their ability to generate a range of body tissues. In this week's Proceedings of the National Academy of Sciences, the Salk scientists and their collaborators at University of California, San Diego, report that there is a consistent, signature difference between embryonic and induced pluripotent stem cells. The findings could help overcome hurdles to using the induced stem cells in regenerative medicine. "We believe that iPSCs hold a great potential for the treatment of human patients," says Juan Carlos Izpisua Belmonte, a professor in Salk's Gene Expression Laboratory and the senior author on the paper. "Yet we must thoroughly understand the molecular mechanisms governing their safety profile in order to be confident of their function in the human body. With the discovery of these small, yet apparent, epigenetic differences, we believe that we are now one step closer to that goal." Embryonic stem cells (ESCs) are known for their "pluripotency," the ability to differentiate into nearly any cell in the body. Because of this ability, it has long been thought that ESCs would be ideal to customize for therapeutic uses. However, when ESCs mature into specific cell types, and are then transplanted into a patient, they may elicit immune responses, potentially causing the patient to reject the cells. In 2006, scientists discovered how to revert mature cells, which had already differentiated into particular cell types, such as skin cells or hair cells, back into a pluripotent state. These "induced pluripotent stem cells" (iPSCs), which could be developed from the patient's own cells, would theoretically carry no risk of immune rejection. However, scientists found that iPSCs had molecular differences from embryonic stem cells. Specifically, there were epigenetic changes, chemical modifications in DNA that might alter genetic activity. At certain points in the iPSC's genome, scientists could see the presence of different patterns of methyl groups when compared to the genomes of ESCs. It seemed these changes occurred randomly. Izpisua Belmonte and his colleagues wanted to understand more about these differences. Were they truly random, or was there a discernible pattern? Unlike previous studies, which had primarily analysed iPSCs derived from only one mature type of cells (mainly connective tissue cells called fibroblasts), the Salk and UCSD researchers examined iPSCs derived from six different mature cell types to see if there were any commonalities. They discovered that while there were hundreds of unpredictable changes, there were some that remained consistent across the cell types: the same nine genes were associated with these common changes in all iPSCs. "We knew there were differences between iPSCs and ESCs," says Sergio Ruiz, first author of the paper. "We now have an identifying mark for what they are." Several years ago, biologists discovered that regular body cells can be reprogrammed into pluripotent stem cells — cells with the ability to become any other type of cell. Such cells hold great promise for treating many human diseases. These induced pluripotent stem cells (iPSCs) are usually created by genetically modifying cells to overexpress four genes that make them revert to an immature, embryonic state. However, the procedure works in only a small percentage of cells. Now, new genetic markers identified by researchers at Whitehead Institute and MIT could help make that process more efficient, allowing scientists to predict which treated cells will successfully become pluripotent. The new paper, published in the Sept. 13 online edition of Cell, also identifies new combinations of reprogramming factors that produce iPSCs, according to the researchers. Led by Rudolf Jaenisch, a Whitehead Founding Member and an MIT professor of biology, the study is the first to examine genetic changes that occur in individual cells as they become pluripotent. Previous studies have only looked at gene-expression changes in large populations of cells — not all of which will actually reprogram — making it harder to pick out genes involved in the process. "In previous studies, you weren't able to detect the few cells that expressed predictive pluripotency markers. The really cool part of this study is that you can detect two or three cells that express these important genes early, which has never been done before," says Dina Faddah, a graduate student in Jaenisch's lab and one of the paper's lead authors. The other lead author is Yosef Buganim, a postdoc at Whitehead Institute. In 2007, scientists discovered that adult human cells could be reprogrammed by overexpressing four genes — Oct4, Sox2, c-Myc and Klf4. However, in a population of cells in which those genes are overexpressed, only about 0.1 to 1 percent will become pluripotent. hierarchy in the later phase of reprogramming. In the new study, Jaenisch's team reprogrammed mouse embryonic fibroblast cells and then measured their expression of 48 genes known or suspected to be involved in pluripotency at several points during the process. This allowed them to compare gene-expression profiles in cells that became pluripotent, those that did not, and those that were only partially reprogrammed. Once the reprogramming, which took between 32 and 94 days, was complete, the researchers looked for genes expressed only in the cells that ended up becoming pluripotent. The team identified four genes that were turned on very early — around six days after the reprogramming genes were delivered — in cells that ended up becoming pluripotent: Esrrb, Utf1, Lin28 and Dppa2, which control the transcription of other genes involved in pluripotency. The researchers also found that several previously proposed markers for pluripotency were active in cells that became only partially programmed, suggesting those markers would not be useful. With their newly discovered markers, "you can eliminate all the colonies that are not completely reprogrammed," Buganim says. "You don't want to use partially reprogrammed iPSCs for patient-specific therapies." To read cells' genetic profiles so precisely, the researchers screened for genes using a microfluidic system called Fluidigm, then confirmed their results with a fluorescence imaging technique that can detect single strands of messenger RNA. The findings also allowed the researchers to develop a new model for how genes interact with each other to steer cells toward pluripotency. Previously, it had been thought that reprogramming was a random process — that is, once the four reprogramming genes were overexpressed, it was a matter of chance whether they would activate the correct genes to make a particular cell pluripotent. However, the new study reveals that only the earliest phase of the process is random. Once those chance events awaken the cell's own dormant copy of the Sox2 gene, that gene launches a deterministic pathway that leads to pluripotency. During the early, random stage, there are probably many ways that Sox2 can be activated, Buganim says. "Different cells will activate Sox2 in different ways," he says. "As soon as you have a specific combination that allows the activation of Sox2, you are on the way toward full reprogramming." The new model also predicted six combinations of factors that could activate Sox2. The researchers tested these combinations in reprogrammed cells and found that they were successful, with varying rates of efficiency. Interestingly, they found combinations that do not include any of the original reprogramming factors. The researchers are now testing their new combinations to see if they produce healthier iPSCs. The most stringent test involves injecting iPSCs into an embryo that cannot give rise to normal cells because it has four sets of chromosomes instead of two. If a healthy animal develops from those cells, it is entirely the product of the iPSCs, demonstrating that the iPSCs were equivalent to embryonic stem cells. Most iPSCs injected into embryos do not pass this test. Source: Whitehead Institute for Biomedical Research, written by Anne Trafton, MIT News. In a study at the University of California, San Diego and VA San Diego Healthcare, researchers were able to regenerate "an astonishing degree" of axonal growth at the site of severe spinal cord injury in rats. Their research revealed that early stage neurons have the ability to survive and extend axons to form new, functional neuronal relays across an injury site in the adult central nervous system (CNS). "Using this method, after six weeks, the number of axons emerging from the injury site exceeded by 200-fold what had ever been seen before," said Mark Tuszynski, MD, PhD, professor in the UC San Diego Department of Neurosciences and director of the UCSD Center for Neural Repair, who headed the study. "The axons also grew 10 times the length of axons in any previous study and, importantly, the regeneration of these axons resulted in significant functional improvement." In addition, adult cells above the injury site regenerated into the neural stem cells, establishing a new relay circuit that could be measured electrically. "By stimulating the spinal cord four segments above the injury and recording these electrical stimulation three segments below, we detected new relays across the transaction site," said Tuszynski. The grafting procedure resulted in significant functional improvement: On a 21-point walking scale, without treatment, the rats score was only 1.5; following the stem cell therapy, it rose to 7 – a score reflecting the animals' ability to move all joints of affected legs. Results were then replicated using two human stem cell lines, one already in human trials for ALS. "We obtained the exact results using human cells as we had in the rat cells," said Tuszynski. The study made use of green fluorescent proteins (GFP), a technique that had never before been used to track neural stem cell growth. "By tagging the cells with GFP, we were able to observe the stem cells grow, become neurons and grow axons, showing us the full ability of these cells to grow and make connections with the host neurons," said first author Paul Lu, PhD, assistant research scientist at UCSD's Center for Neural Repair. "This is very exciting, because the technology didn't exist before." A novel set of custom-designed "molecular beacons" allows scientists to monitor gene expression in living populations of stem cells as they turn into a specific tissue in real-time. 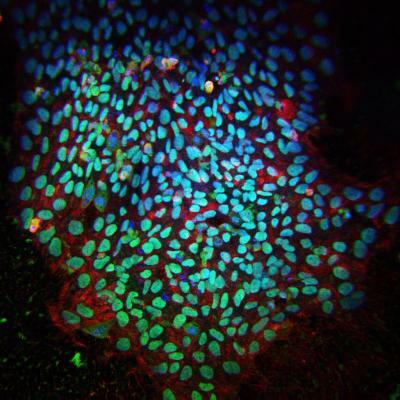 The technology, which Brown University researchers describe in a new study, provides tissue engineers with a potentially powerful tool to discover what it may take to make stem cells transform into desired tissue cells more often and more quickly. That's a key goal in improving regenerative medicine treatments. "We're not the inventors of molecular beacons but we have used it in a way that hasn't been done before, which is to do this in long-term culture and watch the same population change in a reliable and harmless way," said graduate student Hetal Desai, lead author of the paper published online Sept. 5, 2012, in the journal Tissue Engineering Part A.
expresses the bone-specific COL1A1 gene. day nine, left, through day 11 and day 14. By day 16, right, expression begins to wane. In their research, Desai and corresponding author Eric Darling, assistant professor of biology in the Department of Molecular Pharmacology, Physiology, and Biotechnology, designed their beacons to fluoresce when they bind to mRNA from three specific genes in fat-derived stem cells that are expressed only when the stem cells are transforming into bone cells. Throughout 21 days of their development, the cells in the experiments remained alive and unfettered, Desai said, except that some populations received a chemical inducement toward becoming bone and others did not. Over those three weeks, the team watched the populations for the fluorescence of the beacons to see how many stem cells within each population were becoming bone and the timing of each gene expression milestone. The beacons' fluorescence made it easy to see a distinct pattern in that timing. Expression of the gene ALPL peaked first in more than 90 percent of induced stem cells on day four, followed by about 85 percent expressing the gene COL1A1 on day 14. The last few days of the experiments saw an unmistakably sharp rise in expression of the gene BGLAP in more than 80 percent of the induced stem cells. Each successive episode of gene expression ramped up from zero to the peak more quickly, the researchers noted, leading to a new hypothesis that the pace of the stem cell transformation, or "differentiation" in stem cell parlance, may become more synchronized in a population over time. "If you could find a way to get them on this track earlier, you could get the differentiation faster," Darling said. Meanwhile the stem cell populations that were not induced with bone-promoting chemicals, showed virtually no beacon fluorescence or expression of the genes, indicating that the beacons were truly indicators of steps along the transformation from stem cell to bone. Desai said the team took extra care to design beacons that would not alter the cells' development or functioning in any way. 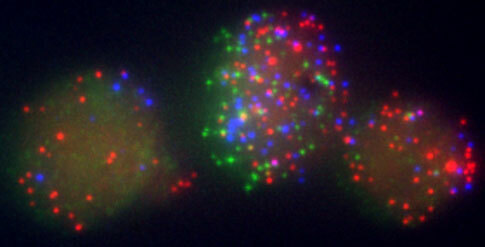 While the beacons do bind to messenger RNA produced in gene expression, for example, they do not require adding any genes to the stem cells' DNA, or expressing any special proteins, as many other fluorescence techniques do. The team performed several experiments using the beacons in conventionally developing bone cells to make sure that they developed normally even as the beacons were in operation. While some scientists design RNA-based probes to purposely interfere with gene expression, this team had the opposite intent. "You know that song 'Hold on Loosely but Don't Let Go?'" Desai said. "That's sort of the theme song for this. There's a set of rules for interference RNA, and we essentially did the opposite of what those rules said you should do." 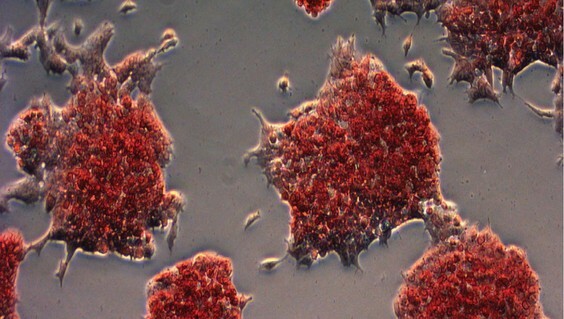 Now that the beacons' performance in indicating milestones of stem cell differentiation has been demonstrated, Darling said, the technology can be applied to studying the process in a wide variety of cells and under a variety of other experimental conditions. In the case of tissue engineering, he said, the beacons can aid experiments seeking to determine what conditions (inducing chemicals or otherwise) are most effective in converting the most stem cells to desired tissues most quickly. They could help tissue engineers learn the best timing for adding an inducing chemical. They might also provide a way for tissue engineers to identify and harvest only those cells that are converting to the desired tissue. "They are becoming bone cells and if you enrich for them and you get rid of all the ones that aren't becoming bone cells, it stands to reason that you will have a better product at the end," Darling said. More broadly, Darling added, molecular beacons are proving useful in a wide variety of gene expression studies. "The reason we are looking at this technique is that we wanted something we could use on any cell, look at any gene and not affect that cell while we are looking at it," Darling said. "If this is acting as we believe it is, we can really look at any gene that we want. It seems like a very versatile tool." Researchers at the University of Maryland School of Medicine, who are exploring novel ways to treat serious heart problems in children, have conducted the first direct comparison of the regenerative abilities of neonatal and adult-derived human cardiac stem cells. Among their findings: cardiac stem cells (CSCs) from newborns have a three-fold ability to restore heart function to nearly normal levels compared with adult CSCs. Further, in animal models of heart attack, hearts treated with neonatal stem cells pumped stronger than those given adult cells. The study is published in the September 11, 2012, issue of Circulation. "The surprising finding is that the cells from neonates are extremely regenerative and perform better than adult stem cells," says the study's senor author, Sunjay Kaushal, M.D., Ph.D., associate professor of surgery at the University of Maryland School of Medicine and director, paediatric cardiac surgery at the University of Maryland Medical Center. "We are extremely excited and hopeful that this new cell-based therapy can play an important role in the treatment of children with congenital heart disease, many of whom don't have other options." Dr. Kaushal envisions cellular therapy as either a stand-alone therapy for children with heart failure or an adjunct to medical and surgical treatments. While surgery can provide structural relief for some patients with congenital heart disease and medicine can boost heart function up to two percent, he says cellular therapy may improve heart function even more dramatically. "We're looking at this type of therapy to improve heart function in children by 10, 12, or 15 percent. This will be a quantum leap in heart function improvement." Heart failure in children, as in adults, has been on the rise in the past decade and the prognosis for patients hospitalized with heart failure remains poor. In contrast to adults, Dr. Kaushal says heart failure in children is typically the result of a constellation of problems: reduced cardiac blood flow; weakening and enlargement of the heart; and various congenital malformations. Recent research has shown that several types of cardiac stem cells can help the heart repair itself, essentially reversing the theory that a broken heart cannot be mended. Stem cells are unspecialized cells that can become tissue- or organ-specific cells with a particular function. In a process called differentiation, cardiac stem cells may develop into rhythmically contracting muscle cells, smooth muscle cells or endothelial cells. Stem cells in the heart may also secrete growth factors conducive to forming heart muscle and keeping the muscle from dying. To conduct the study, researchers obtained a small amount of heart tissue during normal cardiac surgery from 43 neonates and 13 adults. The cells were expanded in a growth medium yielding millions of cells. The researchers developed a consistent way to isolate and grow neonatal stem cells from as little as 20 milligrams of heart tissue. Adult and neonate stem cell activity was observed both in the laboratory and in animal models. In addition, the animal models were compared to controls that were not given the stem cells. Dr. Kaushal says it is not clear why the neonatal stem cells performed so well. One explanation hinges on sheer numbers: there are many more stem cells in a baby's heart than in the adult heart. Another explanation: neonate-derived cells release more growth factors that trigger blood vessel development and/or preservation than adult cells. "This research provides an important link in our quest to understand how stem cells function and how they can best be applied to cure disease and correct medical deficiencies," says E. Albert Reece, M.D., Ph.D., M.B.A., vice president for medical affairs, University of Maryland; the John Z. and Akiko K. Bowers Distinguished Professor; and dean, University of Maryland School of Medicine. "Sometimes simple science is the best science. In this case, a basic, comparative study has revealed in stark terms the powerful regenerative qualities of neonatal cardiac stem cells, heretofore unknown." Insights gained through this research may provide new treatment options for a life-threatening congenital heart syndrome called hypoplastic left heart syndrome (HLHS). Dr. Kaushal and his team will soon begin the first clinical trial in the United States to determine whether the damage to hearts of babies with HLHS can be reversed with stem cell therapy. HLHS limits the heart's ability to pump blood from the left side of the heart to the body. Current treatment options include either a heart transplant or a series of reconstructive surgical procedures. Nevertheless, only 50-60 percent of children who have had those procedures survive to age five. According to the American Heart Association, congenital heart disease may affect approximately one in 100 children. In the United States, more than 1 million adults are living with congenital heart defects. Simpson DL, Mishra R, Sharma S, Goh SK, Deshmukh S, Kaushal S.
The GENCODE Consortium expects the human genome has twice as many genes than previously thought, many of which might have a role in cellular control and could be important in human disease. This remarkable discovery comes from the GENCODE Consortium, which has done a painstaking and skilled review of available data on gene activity. Among their discoveries, the team describes more than 10,000 novel genes; identify genes that have 'died' and others that are being resurrected. The GENCODE Consortium reference gene catalogue has been one of the underpinnings of the larger ENCODE Project and will be essential for the full understanding of the role of our genes in disease. The GENCODE Consortium is part of the ENCODE Project that, today, publishes 30 research papers describing findings from their nearly decade-long effort to describe comprehensively all the active regions of our human genome. ENCODE was launched in 2003 after the completion of the Human Genome Project, and brought together an international group of scientists tasked with identifying and describing all functional regions of the human genome sequence. "We have uncovered a staggering array of genes in our genome, simply because we can examine many genomes in a detail that was not possible a decade ago," says Dr. Jennifer Harrow, GENCODE principle investigator from the Wellcome Sanger Institute. "As sequencing technology improves, so we have much more data to explore. "But our work remains a skilled effort to annotate correctly our human genome - or, more precisely, our human genomes, for each of us differ. These vast texts of genetic information will not give up their secrets easily. GENCODE has made amazing strides to enable immediate access of its reference gene set by other researchers." The team more accurately described the genes that contain the genetic code to make proteins: they found 20,687 such protein-coding genes, a value that has not changed greatly from previous work. The new set captures far more of the alternative forms of these genes found in different cell types. More significant are their findings on genes that do not contain genetic code to make proteins - non-coding genes - and the graveyard of supposedly 'dead' genes from which some are emerging, resurrected from the catalogue of pseudogenes. They mapped and described 9,277 long non-coding genes, a relatively new type that acts, not through producing a protein, but directly through its RNA messenger. Long non-coding RNAs derived from these genes can play a significant part in human biology and disease, but they remain only poorly understood. "If the Human Genome Project was the baseline for genetics, ENCODE is the baseline for biology, and GENCODE are the parts that make the human biological machine work. Our list is essential to all those who would fix the human machine," said Dr. Tim Hubbard. The new map of such genetic components gives researchers more avenues to explore in their quest to understand human biology and human disease. Remarkably, the team thinks their job is not complete and believes that there may be another 10,000 of these genes yet to be uncovered. "Our initial work from the Human Genome Project suggested there were around 20,000 protein-coding genes and that value has not changed greatly," says Professor Roderic Guigo, GENCODE principle investigator from Centre for Genomic Regulation, Barcelona. "However GENCODE has shown that long non-coding RNAs are far more numerous and important than previously thought"
"The limited knowledge we have of the class of long non-coding RNAs suggests they might play a major role in regulating the activity of other genes. If this is generally true of this group, we have much more to explore than we imagined." As dramatic, GENCODE has catalogued for the first time a set of more than 11,000 pseudogenes by examining the entire human genome. There is some emerging evidence that many of these genes, too, might have some biological activity. The GENCODE team predicts that at least 9% of pseudogenes may be active with some controlling the activity of other genes. Pseudogenes have been implicated in many biological activities, such as the prevention of certain elements known to be involved in the development of cancer. "At the announcement of the Human Genome Project draft sequence, we emphasized this was the end of the beginning, that 'at present most genes - probably tens of thousands - remain a mystery'", says Dr. Tim Hubbard, lead principle investigator of GENCODE from the Wellcome Trust Sanger Institute. "Today, we describe many thousands of genes for the first time." "If the Human Genome Project was the baseline for genetics, ENCODE is the baseline for biology, and GENCODE are the parts that make the human biological machine work. Our list is essential to all those who would fix the human machine." The GENCODE human reference set will be updated every three months to ensure that models are continually refined and assessed based on new experimental data deposited in the public databases.